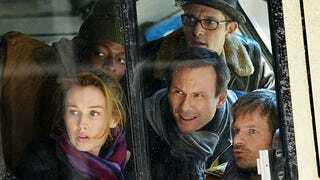 Christian Slater and his band of misfit experts...part 3? I like Mind Games okay. Missed the first episode cause I wasn't paying attention. Thought maybe it was one of those Japanese game shows that ABC copies. Also might have missed it cause of being mad at ABC for not only cancelling Killer Women, but then deciding not to show two of the episodes. Not even sure if the missing episodes are even online yet, as has happened in the past in similar situations. Anyway, not going to get attached to this one, cause I doubt it will last very long. Seems to me Christian Slater has done similar shows, and they last a season or less. Not that they are the same exact show or anything. One of them was about solving murder mysteries that the police had given up on. I think another one was about breaking into places so the clients could see if they needed more security. This one is about "Jedi mind tricks." I like the idea, so far I like most of the people in the show... it's gonna get cancelled before anyone even hears about it.